I am super thrilled to have Martina from Northern Nesting here today. I have long admired her style and her home, plus she is one of the most gracious ladies in all of blogland too. I think you are in for a special treat today, so sit back and enjoy this fabulous tour. I'm Martina from the blog Northern Nesting and I am so happy to be here today!! Thank you so much Marty for inviting me over to be part of your Show Off & Inspire series! We moved into our home 11 years ago and have made many changes since then both inside and out!! I love to decorate and love anything and everything Country French. 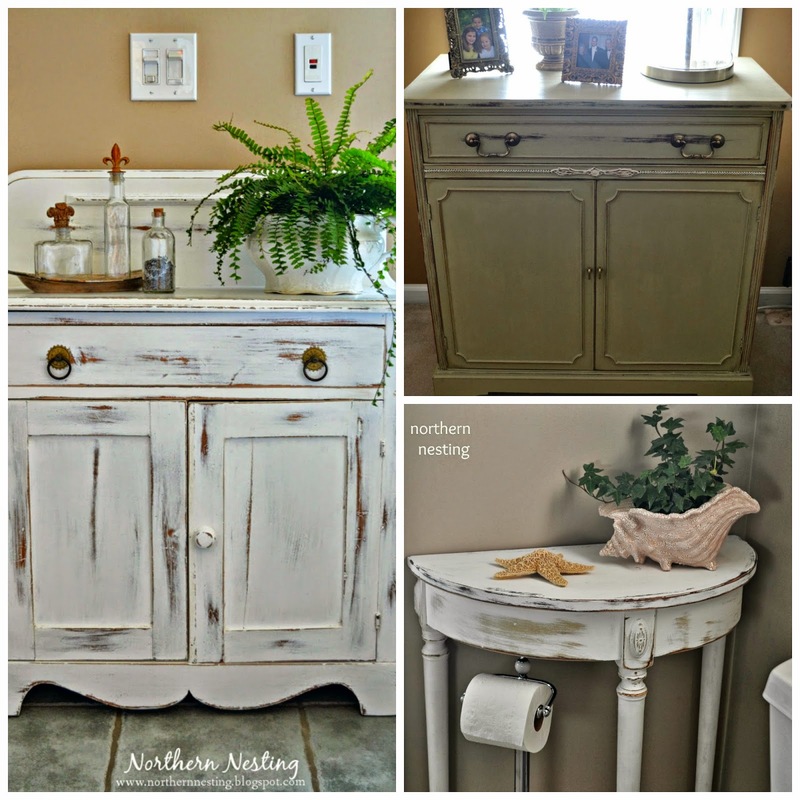 In our powder room we added beadboard and replaced the pedestal sink with a new vanity a few years ago. We literally just finished having all new hardwood floors put throughout our first floor...when it was time to get the rooms back together I made a few changes. It's always fun changing things up right? I just shopped the house and moved pieces around to different rooms until I achieved the look I wanted. I played switch-a-roo with a few chairs from other rooms to give this room a more casual feel...loving the new look! I also love to paint furniture. This chest I found at a yard sale a few years ago and redid it in Annie Sloan chalk paint the color Aubusson Blue...still one of my favorite makeovers! I love mixing old pieces with new. With help from my mom, we recently created this gallery wall over my sofa. All the pictures and paintings I already had on hand the only thing I went out and bought was the "F" initial. 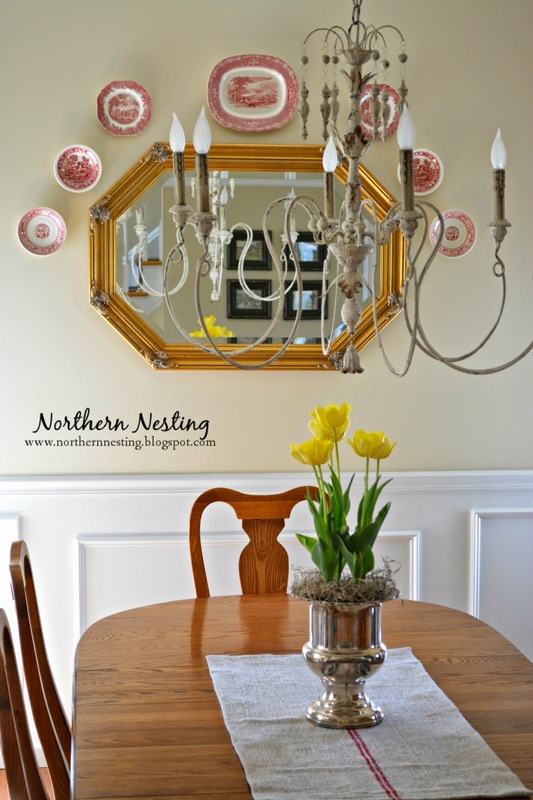 Last year I replaced our old dining room chandelier with this beauty...it fit our style much better! Next up is our front sitting room...this room used to be ours kids playroom but now that their older I was able to change things up in here making it more fit for the hubby...which included moving his recliner from our family room into here. There's our sweet Neena girl sleeping. I just bought this kilim rug for in here from Overstock. I love this room because it isn't large which makes it one of the coziest rooms in our house. I just LOVE our new floors...it was so worth all the dust and mess we had to live with the last month and a half! Along with getting the new floors installed we painted our entire first floor also...the new color is Cornice Tan by Ben. Moore but I had the formula cut in half for a lighter look. The hubby and I transformed our builder grade island a few years ago by adding beadboard and decorative trim and then had it painted black. I recently gave our bar stools a much needed facelift and painted and distressed them black to tie in with the island. Our kitchen opens up to our family room which I love...because this area is definitely our families gathering space. I don't have any updated photos of this room right now as it's in the process of a few changes. Here are a few peeks of how the room looked before. I painted it Chateau Grey AS chalk paint...distressed and clear waxed it. looking in from the kitchen area. 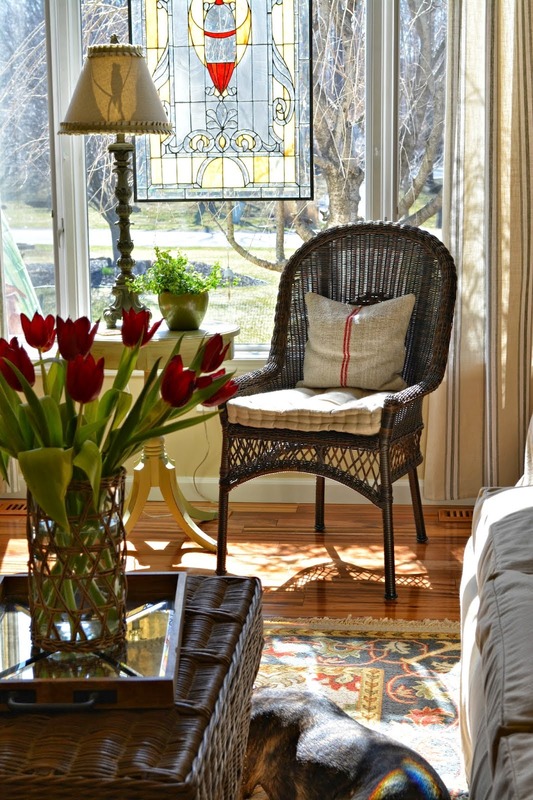 I wanted our home to reflect our style and to be warm and inviting to all who enter. Marty thank you again for letting me be part of this great series!! Isn't her home lovely and oh how I admire those new wood floors. I am saving like mad for some of my own. Now if you don't already follow Martina and Northern Nesting you definitely need to rush over and click the follow button. You will love every one of her projects and posts. Thanks tons Martina for letting me feature you and your gorgeous home, I loved having the chance to brag a little about you. What a wonderfully inviting home! I love Martina's style. Her home is very warm and inviting. I love all of the changes she has been making. Thanks or sharing! Martina, you are a fabulous decorator!!! YOur home is so well appointed and very welcoming! And I adore your attention to DETAIL! What fun getting loads of inspiration from your beautiful home! Thanks so much for this fun post, Marty! Her home is so beautiful and I read her blog all the time. Thanks for sharing! What a great person to feature today! I love Martina's blog and her style. Her home is SO pretty! And I love the new wood floors! Your home is so pretty, warm and inviting Martina. You did a wonderful job in decorating it and with all your changes. I love it! Thanks for sharing, dear Marty. I follow Martina's lovely blog. She has made so many nice changes to her home. I like how she has put her personal stamp on it. Martina has a beautiful home and blog. Thanks for sharing Marty! Me ha encantado visitar tu bloc. Esta semana os propongo disfrutar de una fiesta muy catalana imagenes de de sant jordi espero que os guste u por eso te invito a visitar mi blog y espero que te guste. Si te ha gustado espero que si no eres seguidora te hagas ahora. Every nook and cranny of your home is lovely Martina! Thanks for the tour too Marty! Martina has a beautiful home and I've enjoyed seeing all the posts she has written sharing her changes and updates. Her new floors look great and made me remember the chaos when we did ours last Summer. Martina is always so friendly and I get a smile when I see a comment from her! I love her home Marty and also how she LOVES to decorate! I love her new floors and how she decorated the playroom into a cozy room for her hubs! Martina always comments and I too smile when I see one from her! Love all the recent furniture finishes! Just beautiful!!! Happy to see you feature Martina's charming home. She has done such a wonderful decorating it. Love, love Martina's home...and loved following her in the processes of her new flooring...Martina has a most beautiful home and a great feature Marty!!! I just love Martina's home! Every little thing about it is beautiful and she's just so sweet. Great feature! Martina's home is lovely, she has such great taste! Great feature Marty! I enjoyed every picture! A beautiful home! Heading over to visit. I'm so glad you're featuring Martina's beautiful home, I love her style so warm and welcoming and she is such a sweet lady!! I love Martina's home. Everything is beautiful. Oh Marty...totally love Martina's style...it is so classic! What a gorgeous home she has...every nuance is just spectacular!!! So much style and fineness and elegance...so not surprised Marty you have keyed into Martina...you both have such beautiful style. Hey Marty! Martina has a beautiful home. Lots of natural light coming in all the windows. I love the kitchen! Mercy! What a gorgeous home! Looks just like mine! heh heh! Not in a million years! I always like to visit Martina's home. Her blog was one the first that I started to follow a few years back. Hi Marty, love this feature of Martina's wonderful home and recent changes. Everything is just gorgeous and so inviting. She is so talented with everything she touches. Each and every room is perfection!! So enjoyed the tour!! Thanks Marty for the tour! Yes Martina has a beautiful home!! I love your new flooring, Martina and your home just keeps getting better. Martina has a beautiful home. I love her new wood floors.